This charming piano solo was first performed by its dedicatee, Jacques Leguerney’s good friend and muse Thérèse Cahen (1897-1944), in the Salle Debussy-Pleyel. They met around 1925. Cahen was the first person outside of his family to encourage his musical aspirations. For years, they met every Saturday to read through and discuss his music. She not only helped him with piano and harmony, but also performed his early chamber works, recruiting from her entourage to help him find high level interpreters for his music. 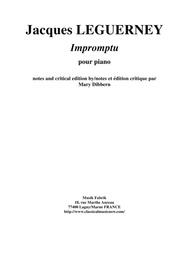 Other early Leguerney works that she premiered included the Trio pour violon, violoncello et piano; the Sonatine pour flûte et piano; and two vocal chamber works presented by the Société Musicale Indépendente (S. M. I. 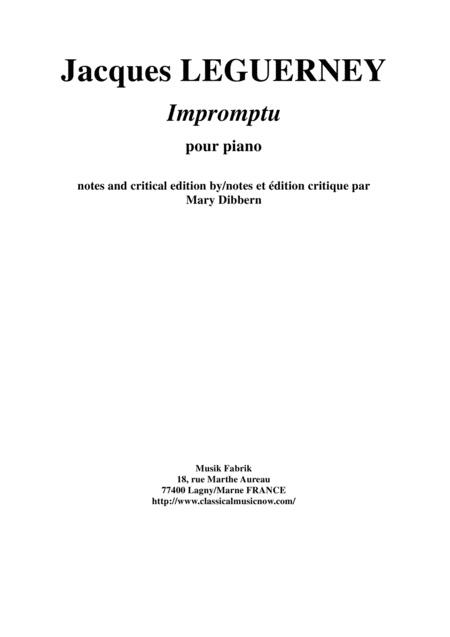 ), Epitaphe guerrière and Clair de lune for voice, flute and piano. Their friendship lasted until Cahen was deported from Paris on July 31, 1944, only a few weeks prior to the Liberation of Paris. Working with the Center of the Union Générale des Israélites de France in Saint-Mandé (a Parisian suburb), Thérèse Cahen had dedicated herself to the care of children of deported French parents. She left Paris with these children in the Convoy 77, and was taken to the gas chamber of Auschwitz. She left a letter for him, along with her grand piano, which remained in his apartment until his death. It is impossible to write on this little page how much I have appreciated your kindness toward me for years and years, and how much happiness this has given me: there have been thousands of Saturdays, and I thought of them every day of the week. Probably you didn’t realize the influence you have had on me: it seems that my whole personality, my way of thinking and feeling has been transformed by you; it is a very deep imprint. If I am taken and in consequence you read this letter, tell yourself that I will continue to count the Saturdays in order to have an idea of the number of songs composed during my absence and that I will be delighted to hear them when I return. If I don’t return, I definitely want you to keep my piano but I don’t think it will happen and I say that I will see you soon. PS Speaking of tenderness, I think with emotion about the little passage concerning tenderness in your latest song.